We arrange for destination weddings in royal palaces, wildlife sanctuaries, adventure destinations and pristine beaches of India. You can book wildlife resorts, beach resorts and heritage hotels in India cities on India Wedding Planner. Have a fairy-style wedding in an exotic locale and celebrate your honeymoon in India with India Wedding Planner. India Wedding Planner takes care of all your travel arrangements to India, from tour booking, hotel booking, flight booking and car rentals, along with all the wedding/honeymoon arrangements. 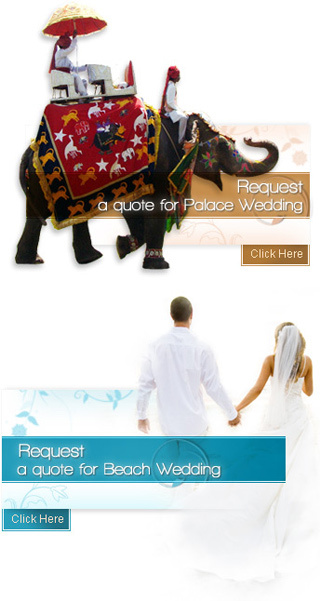 Have an unforgettable wedding and honeymoon in India with India Wedding Planner.